LEGAZPI CITY (Jan 15) – The Philippine Institute of Volcanology and Seismology (PHIVOLCS) has raised the Alert Level of Mt. Mayon in Albay to 3 or increased tendency towards hazardous eruption from Alert Level 2 (increasing unrest). Phivolcs said that for the past 24 hours Mayon Volcano has noticeable increased its unrest. After three (3) Phreatic Erruption (steam-driven) and 158 rockfall events between 4:21PM on January 13 and 7:25 PM, January 14 . 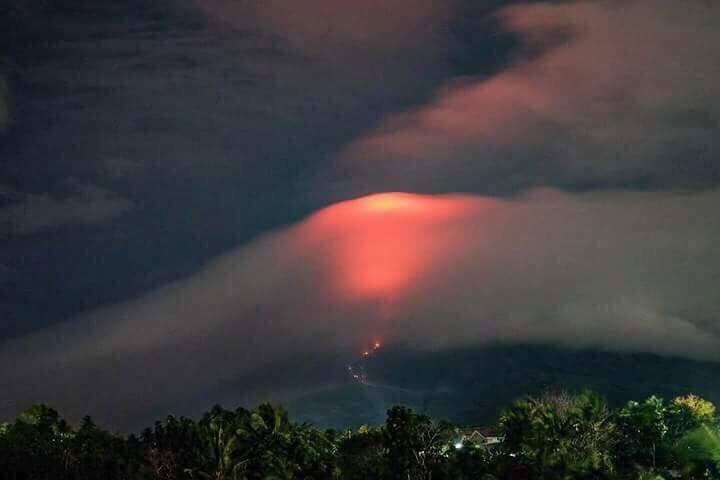 Mayon crater is now exhibiting bright crater glow that signifies the growth of a new lava dome and beginnings of lava flow towards the southern slopes. Philvolcs added that Mayon is exhibiting relatively high unrest and that magma is at the crate and that hazardous eruption is possible within weeks or even days. Enforcement of the 6 kilometer radius-Permanent Danger Zone and 7-8 kilometer Extended Danger Zone on the southern part due to the danger of rockfalls, landslides, and sudden explosions or dome collapse that may generate hazardous volcanic flows.